The Rat Race, our documentary that captivated audiences in Cannes and Amsterdam now set to release in theatres in India ! A film with no star cast nor exotic locations, on the contrary, this is the gritty true life account of Mumbai’s night rat killers. Shot over 2 years The Rat Race documents a story that unravels every night as the rest of the city sleeps. Men hired by the municipal corporation who set out with torches and sticks to bring back the bodies of 30 rats to earn a daily wage. Counted every morning by Parsi Supervisor Behram Harda who likens himself to James Bond because he too has a `license to kill’ this is a film that is disturbing and yet crackles with a dark sense of humor. The Rat Race captivated an international jury in Cannes in 2010 then had 3 sold out shows in Amsterdam where it premiered at IDFA, one of the biggest documentary festivals will now be released commercially in multiplex theaters like PVR and Big Cinemas in Mumbai on April 20th, 2012 followed by Delhi and Bangalore. The film is supported by well known actor and comedian Jaaved Jaaferi who has launched the Indian Documentary Foundation (IDF) an organisation that aims to take the documentary genre to mainstream audiences in collaboration with the International Film Festival of Kerala which organises the Trigger Pitch to match make documentaries with a social cause and corporate partners. Find out more about our promotional contest & event.Please come and join a movement for a change. The Buzz is getting Louder! The last two days have been quite something for the Documentary. Firstly, the news of Rat Race making it to IDFA get published in DNA. The Race is on at IDFA! Its Official!!! Rat Race will be screened at IDFA! Catch its world wide premier in Amsterdam. Ready, set and may not go! We have a few good meetings set up at Cannes where we plan to pre sell the concept to channels. Also our rough cut will be in the digital library at Cannes so potential buyers can access it the whole year through. Solely through our crowd funding initiative we have raised enough money to cover our trip!! Thank you to our 6 donors for making this happen, truly I will confess I was sceptical , hesitant and awkward about it. The only big question is whether after all this I will be able to go? We have been having visa issues from the word go. One month ahead of time, the only available date at the French Consulate was April 1st assuming we got our passports the next day, we would still miss the event which begins on the 2nd and 3rd of April. Finally with a lot of help and guidance we managed to reschedule our French interview at the visa office for the beginning of next week…the only hitch is that I do not have my passport back from the British Consulate where I applied for a UK visa nearly 2 weeks back! It says on their website that for a non settlement visa and if the person has been to the UK within the last 5 years the processing time is about a week…but although I fall into this category for some reason my visa is held up. Am keeping my fingers crossed till the last minute but if not Aruna will have to travel to Cannes and clinch a few deals – solo! Hormis Tharakan, Shanta and Asha for pitching in with all the visa glitches and advise. ” It was love at first sight. It sounds funny but honestly one sound look was all it took for me to be excited and in love with this crazy idea. It was something no one in Indian documentary film making had tried before. But wasnt that the excitement? It started in a dimly lit auditorium, filled with other hopefuls like me. I was irritated to begin with. I was missing the award ceremony of the 48hr film project Mumbai chapter, simply because Miriam would not take no for an answer. She just needed me to be at PVR Juhu at 8.30 am for a Dear Cinema Dialogue Series on Crowd Funding. The upside, I was to get to meet Sanjay Suri, Onir and Sudhir Mishra. So, early one chilly morning, I trudged unwillingly and grouchily from Colaba to PVR making it on time for once. I cleared my registration and was in fact, one of the first people to waltz into the auditorium. I dutifully sat in the front row, knowing that Miriam would insist on a word-to-word account. Mustering my courage, I did manage to interrupt the scores of women wanting photos with the team. Sanjay Suri patiently heard me out and agreed to discuss it at length at a later date. We exchanged our coordinates and I dropped him an email. Nothing much happened after that except a cursory hi at the IFFI in Goa in November. I almost gave up hope. Here was a fabulous idea that could actually work but where was I to get first hand information on how? One fine day, I did get the call. Despite my reservations that this could well be a crank call it did turn out to be Sanjay Suri who enquired about our documentary the Rat Race? I confessed my predicament, I had the idea but no true knowledge. .
Costa Coffee@Versova at 2 pm, Sanjay came in the door and got down to business. Over the course of 2.5 hours, he explained how and why and what nots of crowd funding and its potential for documentary cinema. It was easy to see he spoke with conviction, but was even more heartening to note that he was gracious enough to spend so much time with relative unknowns. Over that time, he made Ruchi, Jimmy and me understand what needed to be done, and left with a promise of being a call away when we needed help. Armed with the knowledge, I met Paul (Director of filament Pictures and astute businessman) to convince him on how this was to work. He heard me out and finally agreed – we did have a great idea. This is the first in our series of posts where we will be profiling the individuals who have joined us in our Crowd funding initiative to take “The Rat Race” to Cannes. is an Avid Certified Instructor and User and also a Consultant Trainer for Qube Digital Cinema products. With a background in advertising and documentary film-making. How did you hear about Rat Race? I have edited some of Miriam’s earlier documentaries and I have loaned her my Avid Media Composer software so she can have access to an edit setup without having to pay for it or juggle studio time. So I knew about Rat Race when she first had the idea to do this documentary. Needless to say the idea is itself was very interesting. What do you think of the Crowd funding initiative of Rat Race? I think it’s a great idea. This film does deserve a wider audience and hopefully helping send it to Cannes will give it a better chance of getting it. Thanks Susan! It’s great to have you as part of “The Rat Race”. The aim for MIPDOC Cannes: a 25 minute cut of my film to show channels and co producers so that they fund a final 52 minute version. The result: I have 3 editors working in tandem, Monisha who shuttles down on weekends from Pune. Hari who comes at midnight after finishing an 8 hour work shift in a channel and Susan who is a full time Avid consultant and trainer who has loaned me her software, troubleshoots with technical hitches between her hectic travel schedule. The film lies in pieces but rest assured… it will shape up in capable hands. Once they are done there is the sound design and mix,simultaneously colour corrections and a spot of graphics by NID alumnus Bodhi. All this is possible because I have onboard a very talented set of professionals happy to lend their time, skills and support – at virtually no cost. But in a documentary we are not talking 48 hours. The Rat Race has already taken 18 months thus far and I am anticipating another 6 months to go – a long, long haul that makes me believe in the power of creative collectivism. I also have an in house dedicated team working round the clock, my producer Aruna – rustling up resources and brokering deals, my husband Paul who is my legal and financial troubleshooter, my brother in law Mathew who is a published author and ready content consultant, Aarghya who has come onboard very recently but is already turning out to be a breath of fresh air. 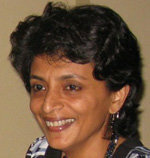 Trupti who has put in months and months of research and spadework for The Rat Race. She recently joined CNBC fulltime. Jimmy who did a one month internship for his MBA with us. Most importantly I have Ruchika and Akash who have got our site up and ticking…and Maneesh who has volunteered to improve the visual features of our site. So we are growing in strength and experience!! Dhobi Ghat has been on my movie radar even before I knew about its connection with rat killers. Kiran Rao is a friend and senior of mine from film school in Delhi. I remember hanging out with her and her roommates in their rented barsaati in Sukh Dev Vihar – shadow puppets dangling from the window screens and coloured patch work frames pasted on the walls. I didn’t realize then that one year later when Kiran and her friends moved out, I would make the very same barsaati my home and creative cocoon for the next 2 years! Kiran’s final year film is probably the only one I remember among the dozens I have viewed in the preview theatre at MCRC. It revolved around a Bengali couple preparing a meal of mustard fish. The film stood out for its mellow approach and the ability to create drama from the mundane…This is the same quality that pervades Dhobi Ghat which is a quiet and meditative journey rather than a dramatic storyline, a film that you experience rather than view. Watching Dhobi Ghat gave me a sense of déjà vu because of the storyline that links characters with spaces to ultimately weave a vivid tapestry of the city of Mumbai, an approach I have been following consciously over the last 18 months to create a narrative for The Rat Race. The Rat Race truly proves that fact is often stranger than fiction. 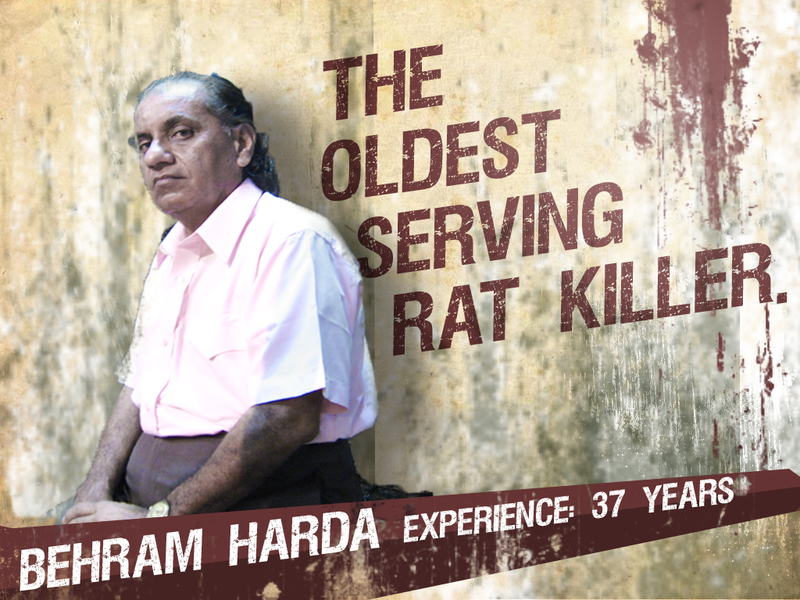 In a striking parallel to Dhobi Ghat, our protagonist 57 year old Behram Harda once dreamt of being a Bollywood dancer but he traded his boogeying skills for the security of a government job that entails counting the carcasses of dead rats every morning for the last 35 years. Watch our trailer and you will know why the audience at Cannes fell in love with his crackling energy, wit and humour. He is the reason that I decided I would make a documentary about rats even though I am terrified of rodents! I am going to sign off in the words of Aamir Khan in Dhobi Ghat “ To Mumbai – my muse, my whore, my beloved…” and also whisper under my breath “Back us up in our Rat Race to Cannes.” Aamir Khan are you listening?!! Check out the reward scheme for contributions to The Rat Race that have just gone up on the site. Thanks Paul, Debasis and Atin Bhai for vetting the legal terms and conditions. `The Rat Race’ website has gone live today! As a film maker who works for the most part in isolation …it feels at this moment like my creative platform just expanded jutting out into the bigger world out there. I think it is especially exciting because the film unfolds an unusual narrative of the lives of rat killers in Mumbai reflecting the contradictions of India’s commercial capital and India at the crossroads. I am sure this space is going to turn into an exciting melting pot of Ideas, resources and energies. Thanks to Aruna, Ruchi and Akash for getting this going, Bodhi for the fabulous gfx and visuals. We were hoping to sort out all legal loop holes to get the crowd funding rolling…but we are waiting for the final go ahead from our legal advisers . Well the first time is bound to take a longer time to get everything up and running, until then warm up to join the Rat Race to Cannes! Getting members of my team to blog about different aspects of the 18 month long journey this far, so watch this space! This time last year an unexpected email popped into my Inbox, one that had the potential to change everything I did – dramatically. The mail said that my documentary film proposal “The Rat Race” was one among 6 other films selected worldwide to compete for the co production challenge at MIPDOC, Cannes. I had submitted the proposal on the very last day and then the customs held up my DVD with film clips…I had lost all hope of making the selection until there it was in my Inbox – an opportunity. My proposal was about rats and the lives of rat killers in Mumbai. I edited a 90 second trailer and wondered what I could say that would win over an international jury? This was my chance, a platform for the first documentary I was attempting independently…If I won it would SURELY open doors. Five years ago, “Waltz with Bashir“ was a finalist in the co-production challenge at MIPDOC and then went on to win prestigious awards -Golden Globes, BAFTA and several Academy Award nominations. This was the year that ‘Slumdog Millionaire’ had swept the Academy Awards, ‘Smile Pinki’ a short documentary made in India had also won an Oscar. The flavor of the year seemed to be India but all these films had been backed by international film crews and resources. Could the luck hold out for an Indian making a documentary about India? The 5 member international jury was chaired by Nick Fraser series editor of BBC, Storyville. He has a reputation for spotting a good documentary and an equally formidable reputation for being completely outspoken. The auditorium was packed as each of the contestants made their 5 minute pitch. I was the last to begin my pitch. I grew steadily more confident as I gauged the audience respond to my Pied Piper tale, a Mumbai Municipal Supervisor, who counted the carcasses of dead rats, likening himself to James Bond because he too had a “license to kill”! The jury was back with a verdict. Fraser lived up to his reputation and was scathing in his summary of each film as he went in order of presentation. It’s a bloody good film, I love the way the fella dispatches rats. The jury was unanimous. The bubbly was uncorked, I felt light headed…this was Cannes and I was giving interviews with the international press. Here is a sobering realization. The dates for MIPDOC 2011 , Cannes have been announced as 2nd and 3rd of April. Less than 3 months to go, I have a free entry to MIPDOC after winning last year, a perfect opportunity to get Television channels and other possible Co Producers on board to fund my film and boost its visibility. This is what MIPDOC is all about identifying promising documentary films and giving it a platform for international co production – funds, collaborations and new markets, I thought they would all pour in. Instead one year later what I have on hand is a raw, unfinished film scrounged together through my own limited resources. I cannot deny I have a lot of interest from international channels but no commitments. It could be the downturn in Europe and the US economies that HAS made investment sluggish; it could be the digital media boom that has seen a glut of documentary filmmakers that channels are now spoilt for choice The reality is that channels who have shown interest hope to see a near complete version of the film so they can make a decision and hedge their bets. The truth for me as a filmmaker is different – film costs money, every aspect involves investment. The fact is, in India we haven’t yet cultivated a healthy documentary culture that supports local filmmakers. The documentary space in India, I believe, is a space we should safeguard, it is an independent and in depth take on contemporary social and political issues. Recent developments including the Radia tapes in the 2 G spectrum scam have shown how mainstream media has been compromised by rampant commercialization of media space. People are realizing the value of good documentaries in generating alternative opinions and there is a slow but steady movement that is yet to gain momentum in India. I have, until now, been pumping in the interest from a fixed deposit my late father left me, to cover equipment hire and shoot expense. This was the obvious choice as a factual documentary has to be shot around events as they unfold . Over the last year, I have already spent most of my inheritance and am still unable to complete the film. I intend to stage a comeback at MIPDOC, Cannes, this year and this site is a last ditch to raise the resources to make a world class Indian documentary that holds its own in the international arena. Read more about the film here. If you like what you see please do support us. The clock is ticking…less than 3 months to Cannes! Copyright Filament Pictures 2011 | All Rights Reserved | This wordpress site is customized by "The Inkline".